Founded by partners Don Ernst and Ray Mattison in 1980, the firm has always specialized in personal injury and insurance law. We represent only the consumer or injured party in suits for damages and insurance benefits. The partners have over 60 years of combined experience as trial lawyers and are supported by an experienced and long serving staff of attorneys and professionals. All cases are accepted on a contingent "no recovery, no fee" basis. While based on California's Central Coast, we also accept selected cases outside of this area. 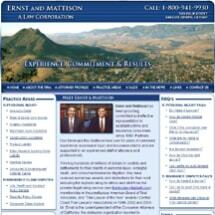 In 2007 we were counsel in major insurance litigation in San Francisco, Los Angeles and San Diego. Don Ernst is a third generation native of San Luis Obispo County. As of 2007 he is President elect of the Consumer Attorneys of California the state wide organization that advocates for accident victims and consumers. Former President of the San Luis Obispo Bar Association, he has received numerous commendations and awards for his advocacy and trial results. Since beginning law practice in 1975 he has tried numerous cases winning large verdicts and settlements for his clients. For more information about his background please see his Attorney Profile. Ray Mattison has specialized exclusively in personal injury, tort and insurance law since beginning practice in San Luis Obispo in 1976. He has received numerous awards and commendations for his legal and volunteer work, including "Trial Lawyer of the Year" for 2006 awarded by the Central Coast Trial Lawyers' Association. He has wide ranging and extensive trial experience. Author of a number of practice related articles Mattison has taught numerous continuing education courses in the field of personal injury and insurance law. For more information about his background please see his Attorney Profile. The firm has a proven track record of winning awards and favorable settlements for their personal injury and insurance clients. We estimate that we have won hundreds of millions of dollars in verdicts and settlements for our clients in personal injury and insurance lawsuits. Our firm won the largest personal injury verdict ever rendered in San Luis Obispo County: $10.2 million (later reduced by the Judge to $5.4 million). In addition to the many cases which ended in settlement, the partners have tried cases involving wrongful death, brain injury, automobile accidents, construction accidents, product liability, aviation accidents, governmental liability and more. While most civil cases do settle "out of court" a critical ingredient of the good settlement is the ability and willingness of your attorney to go to trial. For more details on our experience in our practice areas please see the section of our site: Practice Areas. We have not only handled every variety of personal injury case, from car accidents to product liability, but we have done so against large, tenacious and well funded Defendants such as Ford Motor Company, International Harvester, Pacific Gas and Electric Company, Chevron, the State of California and many others. These cases demand extensive experience, commitment, and a willingness to invest the time and resources needed to "level the playing field" for the individual accident victim and insurance consumer. We have represented numerous consumers whose life, health, disability, or accident insurance claims have been denied. The firm has not only done so for individuals but also for large groups of consumers in class actions prosecuted by the firm. We have successfully prosecuted cases against most of the major insurers including Blue Cross of California, State Farm, Metropolitan Life, Conseco, Prudential, Unum, Paul Revere, American Investors Life and many others. One of the most favorable court decisions for consumers resulted from a successful verdict against a major insurer which was affirmed on appeal (Mariscal v Old Republic). We have tried to return some of our success to the profession and the community in volunteer and pro bono work. Both partners have served as President of the Central Coast Trial Lawyer's Association, and have been devoted and active members of the Consumer Attorneys of California and the San Luis Obispo County Bar Association. In 2006 the firm received an award from the Bar Association for its service. We are proud to have been named "Trial Lawyers of the Year" by the Central Coast Trial Lawyers' Association in 1998, 2002, and 2006. Both partners are members of the American Board of Trial Advocates - a prestigious distinction awarded by their peers that requires extensive jury trial experience and the highest reputation for integrity and commitment. We have worked hard to earn a reputation for competence, commitment, and integrity. The firm has received the highly valued distinction of earning the highest rating for ethics and skill from the premier independent legal rating service.